In my neck of the woods (Mid-Michigan), there are very few quilt shops. Many have closed over the past few years, leaving quilters with few options available to them. Yes, we have larger stores such as JoAnn’s, Michael’s. Walmart, etc. But if we want a good selection of fabrics and tools for hand quilting, we are out of luck. Most small quilt shops don’t carry much in the way of hand quilting supplies. I have heard from many quilters that small shops have even been rude to hand quilters asking for supplies. Why is that? Word has it that quilt shops that carry larger ticket items such as sewing machines can make a LOT more money from their customers than they can from hand quilters. Quite often when I visit quilt shops it is not unusual to see classes in process. The classes I usually see are centered upon sewing with a machine or following a specific pattern designed by the shop owner. I would LOVE to walk in and see a hand-quilting workshop in process. I would LOVE to walk in and see an instructor guiding a class in the design and creation of their own art quilts. What has been YOUR experience with small quilt shops? What do you see on a regular basis? What do you like? What don’t you like? What would you like to see more of? Shop owners, please join in on the discussion. Quilters, please leave your responses in the Comments section below, and feel free to tweet your remarks as well! Music to Quilt By… or T.V.? What’s your pleasure? and Ken Burns collection! 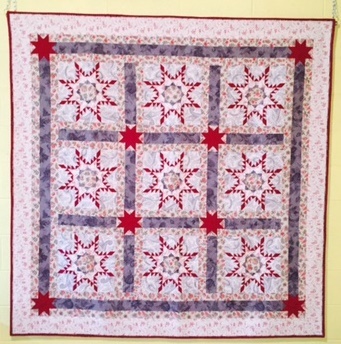 My quilting time is for me… a time to relax, think about what I’m doing or ponder the universe. It’s also a time for listening to some good music or some television show the hubby probably wouldn’t listen to if I paid him… Generally, it’s a quiet time. Right now as I write this, I’m listening to Mary Chapin Carpenter’s “Stones in the Road.” For me, it’s perfect quilting music. It relaxes my muscles and clears my head; I think even the furry girls in my house enjoy it. What do you listen to while you are quilting? Share it with other quilters by using the Comments section below. The Quilts of Ken Burns: You WON’T want to miss this… click on the links below! Writing and Quilting – a Big THANK YOU! I thought I’d share it with my regular readers. Here’s what it said: “Hi, My name is Ryan, I’m a freelance writer and I’m a long time reader of your blog. I’m writing to you because I’d love to contribute a guest post for your website. What do you think about it? I’d be happy to know your opinion about guest blogging opportunities. Look forward to hearing from you. Well, Ryan, That’s an awesome offer! Since you’re a long time reader of my blog, I have some questions for you! Would you please respond to them by leaving your responses to the questions below in the comments area so that others may read them as well? What is your favorite kind of hand quilting thread? Do you double thread your needle all the time? How do you feel about pre-washing batting before you hand quilt? Batik fabrics are lovely in quilts, aren’t they? Do you find them harder or easier to hand quilt? Why? Ryan, do you prefer a long-arm or a short-arm machine for hand quilting? Would you please share the link to your own blog with my readers? We’d like to know what you are currently working on. A picture or two of your work would also be appreciated! The Celebrate Hand Quilting group on Facebook welcomes male quilters. We would be happy to include you in the group. Please don’t hesitate to join by clicking on the link above. Since you are an avid quilter, I am assuming that your offer to be a guest writer on my blog means that you will be willing to contribute free articles on my blog on a regular basis. On behalf of my quilting friends, I’d like to share a hearty Thank you! I’ve been working on a quilt for my youngest grandson for several months now. I think it’s coming along nicely! The quilt is a mixture of different blue printed fabrics that I had lying around the studio. I have made this pattern before for another of my grandsons… I like how it’s shaping up! How about you? I always use Presencia thread for hand quilting. I love how it feels and how it slides through 100% cotton fabric! I would also love to hear what you’re working on! If you have a blog and have posted your most current project on it, please comment below with a link to your blog so others can see! Are you on Twitter? If so, would you please add me to your Twitter list? I will return the favor! Huff and Puff… Nope, better not even come near our house! For the THIRD time in about one year, hoodlums in our neighborhood have destroyed large windows in my husband’s fairly new woodworking studio. Yesterday, hubby had an opportunity to meet up with them BEFORE they did any new damage. They were in our back yard looking in the window, and hubby and our neighbor had a brief chat with them.. a few kids, not very old. All seemed “almost well,” but something was fishy. You could feel it in the air. Then this morning while out walking the dog in our yard, hubby discovered one of the large windows in the back of his studio had been broken with a large rectangle paving stone. An immediate call to the police was made, and plans are in action… This is the THIRD time… and it’s getting old and expensive!